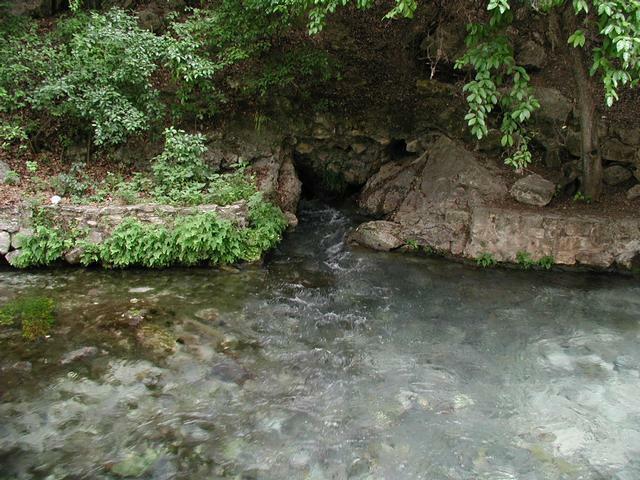 Comal Springs is the largest spring in Texas, and the southwest. Getting there: From I-35 in central New Braunfels take the Seguin Avenue exit and head west. 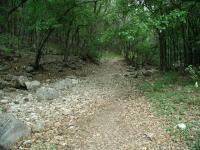 Turn right onto Landa Park Drive and look for the trailhead sign on the left side of the road. 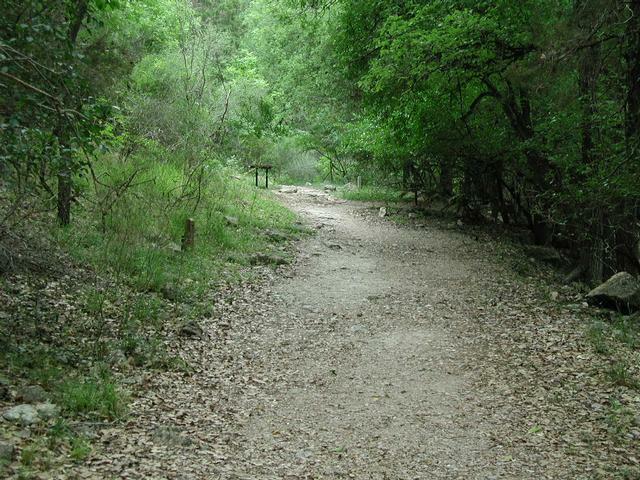 The Hike: The Panther Canyon Nature Trail is a relatively new trail that begins in New Braunfels' main park in the center of town, Landa Park. The hike begins at the waypoint marked "Trailhead". Already, the hiker is provided with a sight to behold. 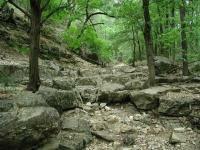 Just to the south of the trailhead lies Comal Springs, the largest in Texas and the southwestern United States. The highest recorded discharge from the springs was over 350,000,000 gallons in a single day in 1977. 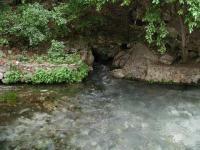 The water gushing from the springs twists a few times in Landa Park before joining the Comal River. Although the walls of the canyon are steep, the trail itself follows the gentler creek bed. The trail heads towards the northwest from the trailhead. 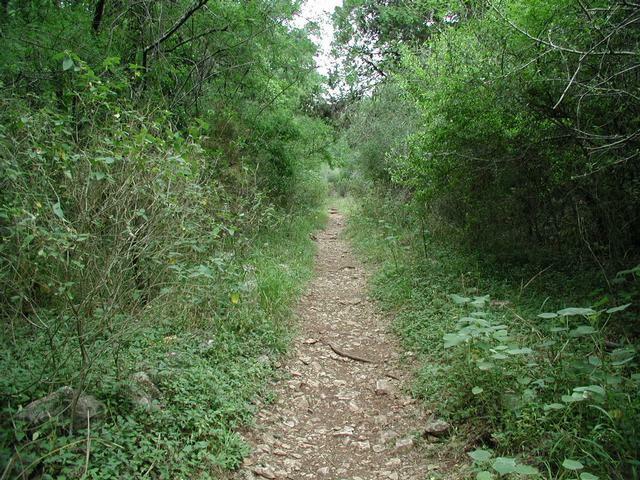 In general the trail is well maintained with occasionally rocky surfaces, though packed dirt is more common. Most of the rocky portions occur at the trail's many creek crossings. 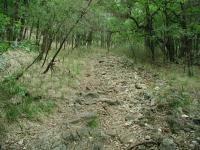 In this short hike you'll cross the creek at least 10 times. Thankfully, the stream is usually dry, as it was on the day of my visit, and so provided no impediments. About a tenth of a mile from the trailhead a small cave opening can be seen on the right. A quick peek into the opening showed an ascending slope covered in rocky debris, leading to pitch darkness. 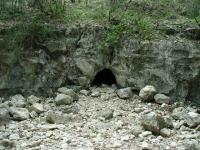 The cave could serve as a discharge point during wetter periods, but could also serve as the home for some wildlife. Alas, I could see no sign that would tell whether either of these were true. 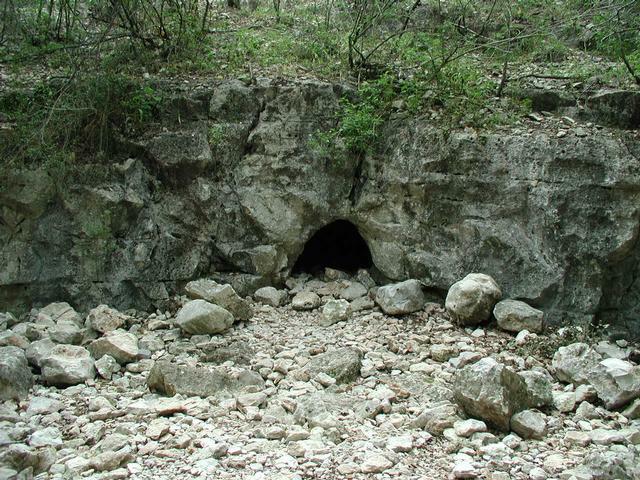 This cave lies near the trail, on the opposite side of the creek bed. It's not that Panther Canyon is not an interpretive trail. I discovered more than 40 numbered stations throughout its length. Although some were destroyed by vandals, the majority appeared to be in their proper location. I had no prior knowledge of the interpretive markers and saw nothing at the trailhead which would help me learn more about the cave, or any of the other features that the markers highlighted. A few segments of the trail are somewhat narrow, but none of it is overgrown. Panther Canyon plays host to a dule of doves. White-winged doves seem to find the dense tree cover ideal for their purposes. A dule is a collection of doves, but strangely they can also be referred to as an arc, a cote, a cove, a dole, an exaltation, a flight, a flock, a funeral, a true love, a piteousness, a pitying, or a prettying of doves. Feel free to choose your favorite collective noun from the list. But the doves were not the only notable bird to be found. At one point I encountered a large Turkey Vulture hopping and darting, in a somewhat ungainly manner, amongst the branches near a creek crossing. Considering the bird's awkwardness I could see why I have seldomly seen them in such heavy cover. The trail crosses the creek that cuts the valley a number of times. At the waypoint marked "Forked?" I took a wrong turn, unknowingly. I saw a trail lead off to the right, but thought the trail ahead was at least as well traveled, if not more so. Wanting to hike the trail proper and not any maverick trails, I proceeded to the left. By taking the proper right turn here the hike distance is probably equivalent, but the trail stops at New Braunfels High School. The fork to the left continues until it runs into Kentucky Street at the waypoint Turnaround, just a block or two from the school. I encountered several people on the trail, but no crowds. This was somewhat surprising, particularly given that upon finishing the hike, back in Landa Park, I found the place to be packed with people, most of whom were picnicking or wading in the water downstream from the springs. It seemed that most people didn't even know the trail was there, just across the street from them. Perhaps that's for the best, at least for us. Took the Cub Scouts out for a hike. Lots of different things to observe. Strange solitude with Landa Park at the trail head. Easy hike and we had it to ourselves. The trailhead is hard to find right at the spring. The bridges are in bad shape. In places the trail is hard to follow and is poorly marked. All this makes it a fun hike. Short but sweet. Nice solitude among the city. 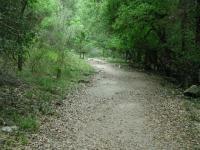 It is amazing how Landa Park is full of people, yet the Panther Canyon Trail is almost empty. -------------- The Parks department went to a lot of trouble this year and put in lots of signs and benches. Sadly, within two weeks almost all the signs are destroyed or defaced and even some of the benches are now broken. -----------------The hike was wonderful as always and usually takes about 35 minutes in and out (I do a small loop at end of the hike instead of just turning around-this loop takes you up one side of the canyon and gives a good short cardio work out---the loop is not on any official map, but is easy to find---when your almost to the end of the hike, the path forks- take the right fork which takes you up a short distance along the canyon. The trail is pretty easy to follow and leads you back down along the main trail within 5 minutes. I have no clue about that little cave. I've lived near this canyon since I was born. The best time (in my opinion) to hike this trail, if you want solitude, is the early early morning. But even if you can't make it early, it's still pretty deserted. 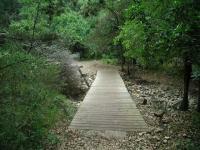 There are several "non-trails" and some newer trails that have been cleared recently. The vandalism really isn't all that bad... it seems like the markers disappear halfway through (if you're coming from the park). Lots of graffiti on the bridge, but some of it is pretty creative. Depending on your personality, it probably won't be a problem. We enjoyed the hike and even encountered a doe and her two yearlings. Our only disappointment was the presence of some obvious vandalism. It is a shame that some feel it necessary to destroy things for no reason.